So it’s two weeks since we completed the North Coast Adventure and we’ve spent most of it in the vicinity of home doing all the practical stuff that keeps us on the road. The van has been serviced inside and out and passed its MOT. The car, that currently spends most of its time with Rachel and Adrian, has also had a major service. Human and dog servicing consisted of hair cuts, dog groomers and a trip to the vet to pick up worming and flea and tick repellent. It was also time to renew our van insurance so we’ve upgraded it to unlimited time in Europe and unlimited mileage to make sure we’re covered for lots more adventures. It’s been a pretty expensive couple of weeks and also a bit unsettling. We decided to stay at Beecraigs Country Park for eight nights while we shifted the vehicles around to the various service centres. We had to keep checking our calendar and the time and twice we had to set the alarm for seven a.m. Even the dogs were shocked, looking up from their bed at the other end of the van when the alarm went off with a “wtf” expression. Amongst all the busy-ness I managed to have a bump in a carpark in Bathgate with another car and it was entirely my fault. I was distracted by a clearly inebriated man wobbling towards me with a shopping trolley and, keeping an eye on him so that he didn’t bump into the car, I moved forward and hit someone else’s car. The woman in the car I bumped was understandably upset and so was I – even more so when I discovered the seemingly endless round of phone calls to insurance companies a small bump entails. Then the complex arrangements to have the minor damage to the front of our car fixed – all of this whilst feeling like a proper chump. Beecraigs is a wonderful caravan site with truly the best bathroom facilities we have come across in all our travels. You get a complete shower room to yourself equipped with a massive wet room type shower, toilet, washbasin, hairdryer and a self operated heater if you need it. In the laundry room, as well as the usual washing machine and tumble dryer, they supply a free to use spin dryer for hand washing and washing lines and pegs outside. They even have boxes of games to borrow marked “Games for rainy days”. It is set in a massive country park so the dogs were in seventh heaven. The one downside was that there is no internet and the phone signal is very poor. This made all the phoning and arranging we had to do a bit stressful. You might be wondering why we felt a bit unsettled and it’s this – back near home and doing all that practical stuff made us realise how wonderful it is to travel and live the very simple life that is motorhome touring. We’re four months into our six months adventure and we’re nowhere near ready to stop. There is something almost addictive about the simplicity, the slow pace of life and the freedom to wander to the next place just to see what it’s like. Of course we miss our family and friends and coming back for a couple of weeks gives us chance to see everyone, which has been great, but at the same time as wanting to see the folk we love we also want to go off a-wandering. My mother once told me that I used to sit in my pram and sing “I love to go a-wandering with a knapsack on my back – fal de ri” … and so on at the top of my voice. Clearly they used to keep infants in their prams until they were old enough to speak when I was a child. Either that or strapping an active toddler into a big pram was the best way to keep her out of trouble. It strikes me now, several decades later, that this song has become my theme tune. It looks like we’ll be spending more time travelling than at home for the foreseeable future. As several people have said – ‘do it while you still can’ – so we will. After all the practical arrangements were done and the vehicles, humans and dogs in tip top condition we headed off to North Ayrshire to spend a weekend in Largs. Shirley was born and brought up just down the coast in Saltcoats and she has many friends in the area so we tootled off west to pay some of them a visit. We parked up for the weekend in the carpark next to the Yacht Haven in Largs. We used to keep our little boat there so it’s a familiar spot and ideally placed for all the delights that Largs has to offer. First stop was the amusement arcade where I went in with five pound coins in my hot little hand and came out with twenty-five. Result! Next was a mahoosive world famous Nardini’s Ice Cream slurped while sitting on the sea front. After that we walked briskly back to the van, telling ourselves lies about walking off the several thousand calories we’d taken in. 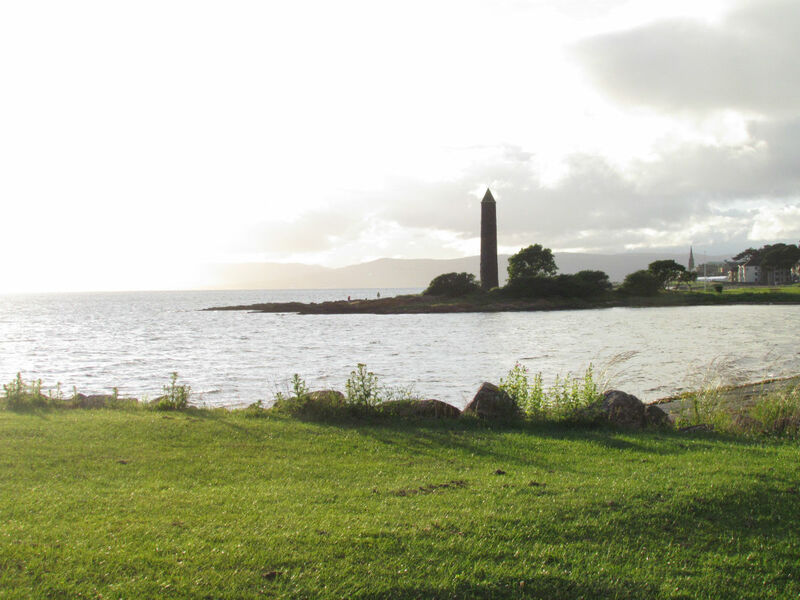 On the Sunday we went to our favourite eating place in Largs. Morris’s Steakhouse is owned and run by Gordon, a lifelong friend of Shirley’s, and we always enjoy going in for a meal, a chat and lots of laughs. If you’re ever in the area we can thoroughly recommend it. Parked up beside the sea, watching the boats from the marina tootling about and listening to the gentle sound of the water lapping the shore we felt truly contented… and very full of food. After our weekend of feasting on food, friendship and sea air we returned to Penicuik to swap accommodation with Adrian, Rachel and Cara. They went off for a well deserved break in Holly and we moved into their house. How weird is this? We’ve got stairs – and a bath – and a full kitchen – and sofas. We can watch Wimbledon without swivelling the aerial around and get wifi as often as we want. We’re really enjoying the change and the chance to catch up with more friends. I think we’ve found the best of both worlds. The family can have a wee holiday and we can do the real house thing for a few days then we’ll be off again. I reckon we could keep doing this for months. Anyone want to rent a 4 bed detached house in Bathgate? Next destination – Dumfries and Galloway, the land of big sky and stars. Watch this space. So glad you’re still enjoying your adventure and not hankering to get home. If anyone is enquiring re. the house for rent, can I just say it is a lovely house, a generous 4 bed with plenty of room for a family of 5 (and a big dog) to sprawl out in with a sunny garden. Highly recommended ? Go! Go! Go! As we found when we were ‘home’ for 2 weeks … it feels too much like WORK. So many chores and not enough time to be. No brainer. Did you read about Pat from Brin’s disaster on the wild camping forum? His MH has burnt out, but he’s OK.
I’m jealous. Patricia says to talk with her AFTER you’ve been on the road for five years! We’ll be back in Europe next April. We will fly from Palm Springs or Orange County Airport to Miami and then catch a cruise from there to Southampton. Our cruise has been booked and we leave Miami on April 28th; 15 days on the ocean and then into Southampton. After that, nothing specifically booked but we’re hoping for Ireland, Scotland or France. We’ll be back in Palm Springs in October, 2017. Aww I’m really sad to be at the end (for now). You have such a fantastic storytelling ‘voice’ Margaret, and all Shirley’s fishing successes make me want to give it a go (if only I had my own personal fishing to deal with the icky guts and stuff!) ? We are doing lots of researching now, making plans for when we get our van, and we recently joined the MHFun site (Mo found your blog from there; she has a real knack for finding the good stuff!) so I’m sure we will see you on there (we’ve been members of wild camping for a few years too but don’t post much), and maybe we’ll catch up at a meet sometime. * personal fishmonger… sometimes autocorrect on my tablet thinks it knows better than me what I’m trying to say. Must proof read before submitting!